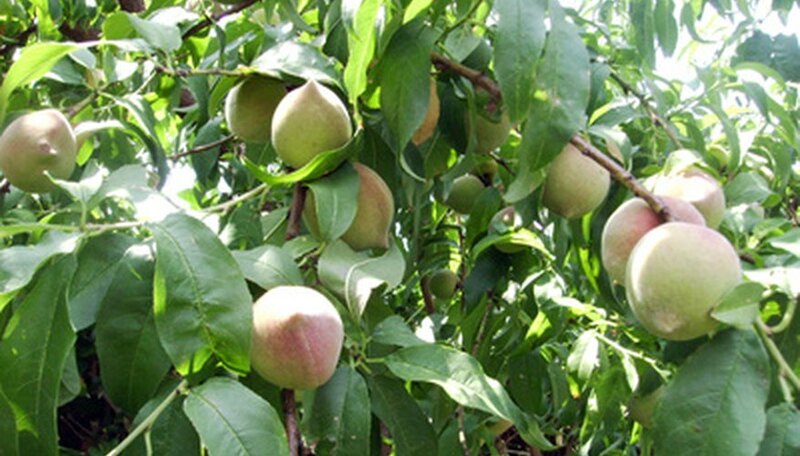 Although dwarf peach trees are much smaller and more manageable than regular peach trees, they still require much of the same care you would give a full-size peach tree. Provide annual pruning of a dwarf peach tree to keep the tree healthy and attractive. Because of the smaller height of dwarf peach trees, you can access all areas of the trees easily without a ladder. Prune a dwarf peach tree in the spring to keep it healthy and productive. Spread the tarp beneath the fruit tree to catch the branches you cut. Cut away the suckers that grow up from the trunk and from the established branches. These thin branches do not contribute to the health of the tree or fruit production, and only decrease tree energy and sunlight exposure to the tree. Clip these suckers off where they connect with the trunk or larger branches. Look inside the central growth of the tree to find any branches that cross or rub on each other. Cut these branches off where they connect with the tree trunk. Cut off any diseased or dead branches where they connect with the next largest branch. Shape the outer perimeter of the peach tree to keep it growing within the size range you desire. Remove up to one-third of the branch length around the outer edge of the tree with pruning shears. Pull up the tarp to dispose of the branches and leaves you removed during the pruning process. Wait to prune the peach tree until the final spring frost of the season and before the tree begins to blossom.